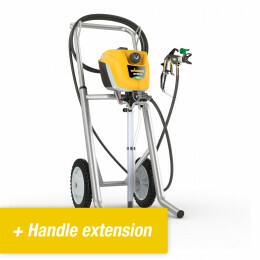 An Airless / HEA paint sprayer is often used for "larger" surface areas. Think of interior walls, exterior walls, fences, furniture construction, etc. Nearly all paints can be applied with an Airless / HEA paint sprayer. 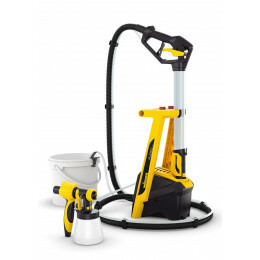 An Airless paint sprayer is a device that falls under a specific category of paint sprayer. In general, there are three techniques besides the conventional techniques of painting with a roller or brush. The different techniques are called Airless (High Pressure), HVLP (Low Pressure) and XVLP (which falls in between the first two). Airless appliances are used if the result has to be really smooth. The beauty of Airless is that the finish can hardly be smoother. Many professionals as well as DIY users and consumers use this technique. Think, for example, of your smoothly plastered walls. It would not be a good idea to go over these walls with a roller. Airless sprayers should actually be called high pressure paint sprayers, but because HVLP works on air pressure and Airless doesn’t, this technique has become known as Airless. We have a number of Airless devices in stock, so you can quickly get started to create the best results at home or in your clients’ buildings. All products are tested batch-wise and have been fully developed over the years. This enables us to provide you with the highest quality Airless sprayers available in the market. This very common technique forces paint through a nozzle (spray tip) under a pressure of 150 to 250 bar. The technique is used particularly for larger areas and usually produces a very fine and even spray. Virtually all liquids on both water and synthetic basis can be sprayed. Also thinner-based paints and polyurethane varnishes. Tailing (track forming) is a common problem with Airless sprayers. This comes about because the paint is too thick for the tip used. You can avoid this by checking the job description/technical sheet from the paint manufacturer. This will tell you which tip you need to process that particular paint. Airmix and Airless are very similar techniques. The only difference is that Airmix uses compressed air as well. The pressure of the sprayer is about 50 bar. However, air-supported spraying adds about 1–1.5 bar of compressed air to positively influence the spray pattern. There are various paint spraying techniques. One of the most famous is “Airless”, which literally means “without air”. Because of that many people think that it produces very little mist. In In fact, however, the paint is blown under pressure through a small hole (spray tip) and an Airless sprayer is not entirely without air. An Airless sprayer usually consists of a suction pump that forces liquid through a spray tip as explained above. The liquid can be either paint, stains, emulsions, primers or any other water- based or synthetic-based liquids. Usually you cannot use an Airless machine for paints with granular solids (used in fillers and for some colors). Virtually all paint types are sprayable with an Airless. This is because of has special spray tips available in hundreds of sizes, ranging from tips that can handle very viscous liquids to tips that can handle extremely thin liquids. A spray tip simply clicks into the paint gun so you can easily change it for thicker or thinner paint. An Airless sprayer is usually more suitable for large surface areas and in nearly all cases it is a practical solution for interior wall paint (latex). Almost any Airless sprayer can handle big lacquer and staining projects. If you want to spray thicker paint for outdoor projects (exterior latex), professional paint, or flame retardant material, you will often need a larger spray tip. You should carefully check that the machine you buy has sufficient capacity for the job. The manual will explain what maximum tip size a machine with a certain capacity can handle. Do you know what kind of paint you want to use? Then ask for the technical sheet. This will indicate if the Airless can spray the paint and if so, what the maximum tip size is. This means you will always buy the right paint sprayer with the capacity you need. The Airless tip stands for a beautiful spray finish, a large surface area, durability, spray pattern and relatively long cleaning and installation time. Due to the relatively broad spray pattern (overspray), you will need to tape off more than you would with other techniques. However, once you have started, you can quickly created an extremely good finish on your walls, shutters, woodwork, boats, etc. Common projects for this sprayer type are: indoor and outdoor walls, wooden (garden) sheds, ships (especially two-component paints). Series of furniture, doors, floors, impregnation projects, etc. How does an Airless spray painter work? 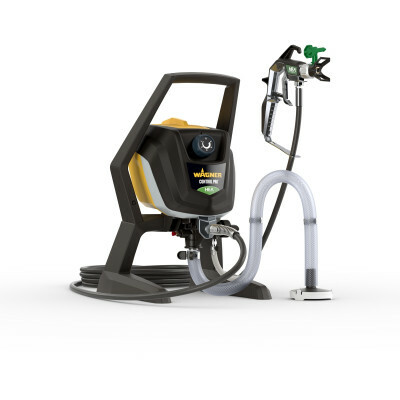 Put simply, like any other paint spraying device, an Airless sprayer is a machine that produces a mist of paint. It can do this in two different ways. First, by blowing a combination of air and paint through a small opening (nozzle or tip). The other way is to force paint under high pressure through the small opening. An Airless sprayer works like this with a suction hose. Paint is drawn out of the container and forced under high pressure through the hose to the spray gun at the end. The spray gun has a tip with a small opening. When the paint is forced through this opening, it atomizes (forms a mist). Because of the very high pressure, the mist is very fine and as a result the finish is often very smooth. There are several devices on the market ranging from small hand sprays to big trolley mounted Airless machines which offer the necessary advantages for spraying large areas. An Airless sprayer can handle various liquids. You can select the right Airless machine for job based on the paint thickness and surface area (number of m2) to be sprayed. There are a number of different Airless sprayers, subdivided into the conventional Airless machines and the new range of HEA – High Efficiency Airless – machines. The older line is based on machine capacity (power). The higher the power and yield, the better the atomization. This is true to a certain sense, but it also has its downside. For example, the finish of these machines may not be so neat and they tend to produce overspray, purely because of the high pressure. Meanwhile, however, the technology keeps on developing further and the improved spray tips can be used with less pressure. The new HEA tips are far more effective, producing perfect atomization under less pressure. The benefits include being able to work more neatly in cleaner strokes, with far less overspray outside the edges of the stroke. In addition, HEA Airless machines even claim a 50% reduction in overspray, making the work cleaner and neater too. Finally, this machine is less susceptible to wear which must result in higher operational reliability and a longer service life. Why an Airless paint sprayer? An Airless sprayer is especially distinguished by its clean finish. Unlike other techniques, the Airless spray gun is so good at atomizing paint that it sprays walls or any other similar object extremely well. For many people, for example, plastering is an expensive part of a building or renovation project. Only Airless produces such a clean finish that it justifies painting over newly plastered walls. In addition, Airless machines are capable of painting large areas. These machines truly devour square meters. In some cases you can hook the paint can onto the trolley and spray the walls of, say, a shed or large space as you walk along. 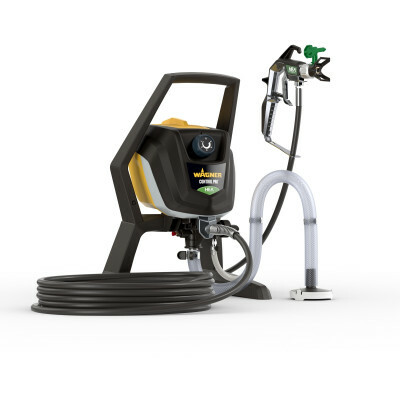 HEA stands for High Efficiency Airless, Wagner's new Airless paint sprayer technology. The completely new HEA series replaces Wagner's successful Project Pro and PowerPainter series. This new technique provides an even better and fuller spray than current Airless machines, which currently represent the highest standard in the market. HEA combines the advantages of two existing technologies: HVLP and Airless. HEA integrates these two advantages in one machine. This Airless paint sprayer works under low pressure, reducing overspray by some 50%, making it easier to handle than a standard Airless sprayer. Due to the low pressure and new tip technology, the paint sprayer is more forgiving or accommodating, meaning that you will get fewer runs and less uneven coverage than you would with current Airless and HVLP technology. Besides reducing overspray, Wagner HEA Control PRO gives you more control. Whereas you often had to overlap your strokes before, the softer spray fanning out of the HEA paint sprayer means you can avoid this. Your strokes will look smoother and neater, making it is easy to place them beside each other instead of having to (partially) overlap them. The HEA paint sprayer is available in four variants in total, two lighter models and two heavier models with more power. The material used in the fabrication makes the difference distinct: two models have plastic (R) housings and two have metal (M) housings. Where consumers would consider using the plastic variants, the professional would probably go for the more robust metal machines. 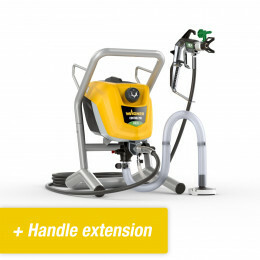 The number in the product name indicates the difference in power between both types of Wagner HEA sprayers: the 250 (= lighter model) and the 350 (= heavier model). As mentioned earlier, not all of the accessories apply to the new HEA paint sprayer. Where before you had to put a matching filter in the handgrip of the machine, now you no longer need this. The full range of spray painting tips, however, will remain useful especially because you want the best result. However, the new HEA tip has gone through revolutionary development. Thanks to the new tip technology in the HEA, Wagner has been able to reduce overspray by some 50%. Which means you can now work a lot cleaner (waste far less paint) and get even better results. Also, they have paid due attention to the spray gun. Now it fits even better in your hand and has a more sensitive two-finger trigger. The whole gun is made of high quality metals. HEA is a completely new technique developed by Wagner. It has all the features of Airless plus some HVLP features to combine the best of both worlds. As you can read in the Airless section, an Airless machine is suitable for spraying large surfaces, has a wide range of applications and provides a nice finish. However, an Airless sprayer produces relatively a lot of overspray, is harder to use, less forgiving, and makes quite a bit of noise. HVLP, on the other hand, may offer a slightly less attractive spray pattern, but it is friendlier and easier to use, produces less overspray and is also suitable for a wide range of jobs. Better said: it is especially suitable for smaller areas and less intensive use. And now there is HEA, which stands for “high efficiency Airless”. As the name suggests, it is still a kind of Airless machine. The difference lies in the capacity. An HEA paint sprayer has less power than an Airless sprayer but delivers the same liter yield per minute (speed of work) and can handle the same maximum viscosity (maximum thickness of the paint). The revolutionary design combines the refinement of HVLP with the power of Airless. As a result, you get a sprayer that produces less noise, produces 50% less overspray, is far more user-friendly, has a higher liter yield, can handle thicker paint and is far more forgiving than Airless. In addition, the spray pattern of HEA is even more attractive than Airless. The brute force of Airless sets it apart from this promising advanced technology. So, is it all over for Airless? We don’t think so! We think Airless is just moving on to bigger projects, such as huge halls and warehouses. Projects that involve lots of meters a day will keep on finding the brute force of Airless very desirable. However, if you are a demanding consumer, a freelance painter, or a landlord (of apartments), then HEA would be a more than interesting option for you. HEA stands for a particularly nice spray, user friendliness, up to 50% less overspray, fast working and very wide range of use. Common projects for this type of paint sprayer include: indoor and exterior walls, wooden sheds, ships (especially two-component paints). Furniture, doors, floors, impregnation projects, etc.